Calorie-burning aerobic workouts can help you reach a healthy weight. When you burn more calories than you consume over a period of days or weeks, your body will draw on stored fat for energy, causing you to lose weight. 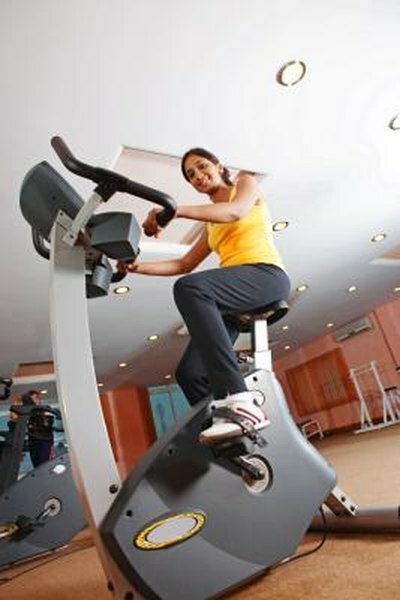 Stationary bikes provide convenient, moderate-to-vigorous aerobic workouts that can help you achieve your weight-loss goals. Healthy weight loss should occur slowly and steadily at a rate of about 1 to 2 lbs. per week, according to the Centers for Disease Control and Prevention. For every pound you want to lose, you’ll need to burn 3,500 calories more than you consume over a period of days or weeks. To lose 1 lb. a week, for example, you’ll need to burn 500 calories more than you take in each day. To lose 2 lbs. a week, you’ll need to burn 1,000 calories more than you take in each day. Working out on a stationary bike and following a reduced-calorie diet can help you achieve this caloric deficit. The number of calories you burn with a stationary bike workout will depend on your weight, the length of the workout and the intensity of your effort during the workout. The more you weigh, the faster you will burn calories, and the longer and harder the workout, the more calories you will burn. In one hour of biking at less than 10 mph, a 160-lb. person can burn 292 calories. With the same workout, a 200-lb. person can burn 365 calories and a 240-lb. person can burn 436 calories. In one hour of biking at speeds greater than 10 mph, a 154-lb. person can burn about 590 calories, according to the Centers for Disease Control and Prevention. Stationary bike machines typically provide several preset workout modes. In manual mode, you can adjust the resistance of the pedals manually throughout the workout to simulate hills. In preset modes, the pedals’ resistance will change automatically according to a preset pattern. Common preset workouts include hills, intervals and fat burn. Regular physical activity can benefit your health in many ways. Getting at least 150 minutes of moderate aerobic exercise each week can reduce your risk of heart disease, metabolic syndrome, Type 2 diabetes and some cancers, according to the CDC. Regular exercise can also improve your mental health and mood and promote better sleep, suggests the CDC.